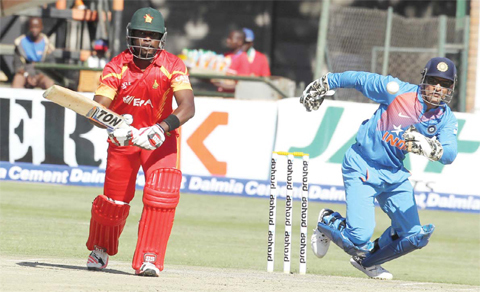 HARARE: Elton Chigumbura smashed an unbeaten 54 from 26 balls as Zimbabwe stunned India with a two run win in the first Twenty20 International at the Harare Sports Club yesterday. Chigumbura pummelled seven sixes as he took Zimbabwe to 170 for six in their 20 overs having been sent into bat by the tourists. India lost opener Lokesh Rahul on his Twenty20 debut in the first ball of their reply, but they went into the final over from seamer Neville Madziva needing eight to win. That was reduced to four off the last ball with Mahendra Singh Dhoni on strike, but he could only bludgeon the ball to deep point and Zimbabwe celebrated a second consecutive victory over India in the 20-over format. Aside from Chigumbura, Malcolm Waller (30 from 21 balls) and opener Hamilton Masakadza (25 from 15 balls) gave Zimbabwe their highest score against India in Twenty20 cricket.